This interesting name is a good example of the medieval 'cult' of creating patronymic surnames from popular existing personal names. In this case the development is from the French 'hugh' itself a variant of the Olde German 'hugo', which translates as 'mind' and was presumably a name given to a thinking person. 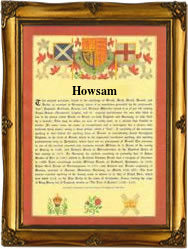 Subsequently dialectual transposition has created a number of modern spellings which include Howson, Howsin, Howsan, Howsam and Housin whilst early developments include Howesson (1379 Yorkshire Poll Tax), Howissone (1374 Norfolk) and Howisone (1450 Scotland). The first recorded spelling of the family name is shown to be that of Carolus Howson which was dated C. 1350 The Church Rolls of Yorkshire during the reign of King Edward 111 The Father of the Navy 1327-1377 Surnames became necessary when governments introduced personal taxation. In England this was known as Poll Tax. Throughout the centuries, surnames in every country have continued to "develop" often leading to astonishing variants of the original spelling.